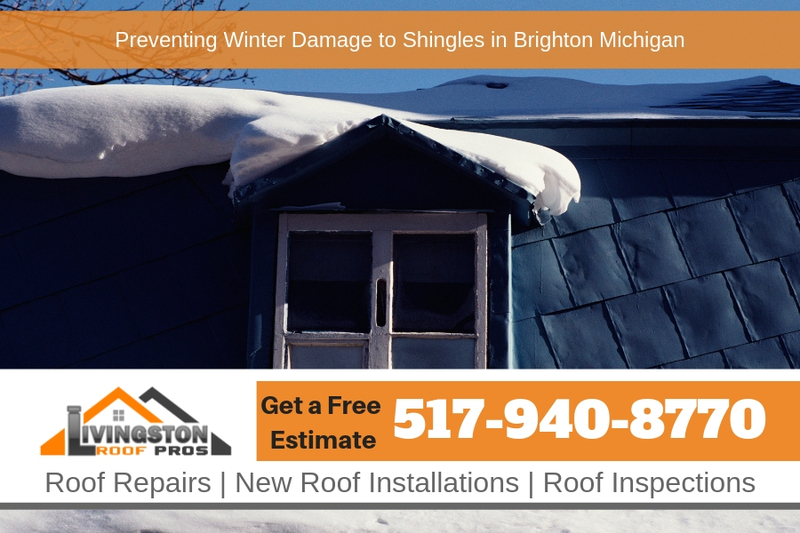 Winter can be a tough time for your roofing in Brighton Michigan. Your shingles are expected to withstand more wind, more moisture, and more exposure to the elements. It is important to stay vigilant about the strength of your shingles during this time, especially. The following are some useful tips to ensure that your home provides you with the warmth and comfort that you need on the chilliest days of the year. Not only will this help your roof last longer but it can also cut down on maintenance costs associated with your roofing. The weather in Michigan can be downright brutal at times. Freezing cold weather in the winter with snow and ice can cause all sorts of problems with your home’s roof. Not only that but since the temperatures are so cold, usually replacing your roof is not advised. There are circumstances when a new roof in winter is a must but most roofing contractors would rather replace the roof during warmer weather as shingles will seal better. Keeping your roof in good shape with regular inspections can help to prevent many of the problems that are associated with winter weather but not all. When you need roofing repairs or a new roof in Brighton Michigan during the winter be sure to call the professionals at Livingston Roof Pros. One of the most simple and easiest methods to utilize is a visual inspection. Keep tabs on what is going on with you roof by looking at it from ground-level. You should be able to notice any obvious cracking or peeling that can often start to occur. Also, it is a smart idea to regularly inspect the interior of your attic, if you have one. While it is impossible to see all problems with the naked eye, this is still a useful starting point. If you notice anything out of the ordinary at all, it is likely to become a much bigger problem. By doing these inspections, you will also have a better idea of how to explain the problem to your local contractor. Leaves and branches can appear to be harmless, but strength comes in numbers. If you allow debris to collect on your roof, this also allows the chance for moisture to gather. It is no surprise that moisture is the gateway to many leaks, finding its way to any and all cracks in your shingles. This being said, make sure you clean your gutters out regularly! Also, trim your trees and any tall foliage that has the chance to deposit debris onto your roof. As previously mentioned, gutters are very important to the quality and durability of your roof! Keep them clean, because they are a means of egress for certain debris and moisture. If your gutters are clear, but there still appears to be buildup, you might need to adjust the angle in which they are draining. Remember, your gutters and downspouts can also break down from regular wear and tear, so if you begin to notice any signs of this, your roof will eventually become impacted. Ice dams can form in any crevice or crack, from your roof to your gutters. While it can be troublesome to make sure that they stay broken up, it is very important, because they cause the most significant damage. It is impossible to go outside after every storm and clear the pathways, but making sure that your house is well-insulated is one way to make sure that they stay clear. It is also a smart idea to check on your home’s ventilation passageways. A common error that many homeowners face is waiting until the weather warms up to inspect any potential problems. Act now! Many roofers will do the inspection for free, so it is never a bad thing to schedule a consultation. Be sure to call Livingston Roof Pros today if you suspect a problem with your home’s roof at 517-940-8770. We have fully qualified roofers on staff that can help you get your roof back to protecting your home fast! Call today for a free estimate on roof repairs or a complete new roof installation in Brighton Michigan.